On this page you find software written by me and various other downloads. Please note that everything on this page has been written in my spare time, using my own hardware and software ressources, and is not affiliated with any current or former employer. JAggregator is a News Aggregator that pulls news stories, weblog content, stock informations and other XML-based content from the web and includes it in a single web page. It processes RSS 0.9 to RSS 2.0. Atom is currently not supported. Unfortunately, I'm unable to continue the development. Feel free to download and enhance the software. 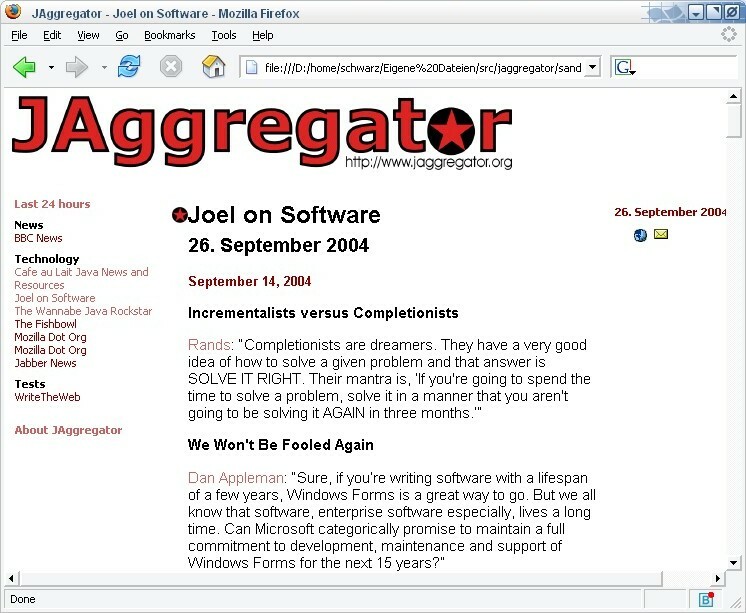 Weblogs.com, Technorati.com, Javablogs.com and several other aggregation services expose a web service for tracking updates to weblogs. Usually, weblog software already contains functionality for pinging those services. As I don't run a typical weblog software I developed my own pinger with Python 2.2. It implements the so-called Weblogs.com-API. In the year 1999, I had a need for a Swing-based plotter/charting package. Back then nothing free was available so I developed jsz.Plotter. Feel free to download the package. Please note that I stopped developing the package a long time ago. I'm unable to provide support for it. I used to use GNU Emacs exclusively for all my editing needs. This archive contains my latest configuration for GNU Emacs. It consists of several additional Emacs packages, i.e. pcl-cvs, and config files for the packages I use. I can't guarantee that it works out of the box with your setup. At least, it is very likely that you have to adjust the load-path. Please note that I stopped updating the package a long time ago. I'm unable to provide support for it. CityDesk is a Windows-based content management system; I use it to maintain all my websites. It completely automates the whole process of formatting pages, creating a home page and navigation, and publishing the site to a web server. I've translated Andreas Viklund's andreas08 template to CityDesk. Due to a limitation in CityDesk, I had to change the way the current navigation tab is highlighted. Otherwise, it was a straightforward conversion of Andreas's sources. This site serves as a demonstration.